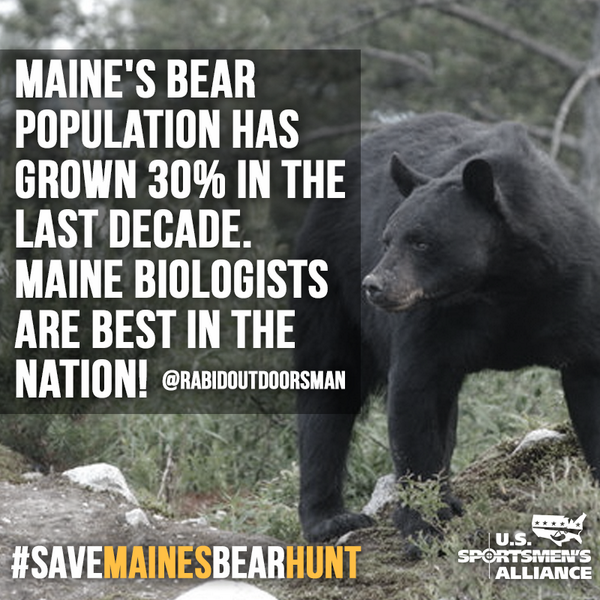 The Maine Outdoorsman: The Rabid Outdoorsman "BEARS" it all on Question ONE! The Rabid Outdoorsman "BEARS" it all on Question ONE! This November, Maine voters will be faced with a referendum asking residents to end the three primary methods (baiting, hounding and trapping) of hunting black bears in this state. Both sides are of course passionate about ultimately being victorious and to win are embroiled in a battle using a combination of biological statistics and raw emotion to push their agendas. I wish we could spend all the time, energy and money that will be spent on “Question One” instead working toward curing childhood diseases, improving our states educational system or combating domestic violence but unfortunately, the Humane Society of the United States (HSUS) has decided that for the second time in a decade, Mainers need to raise and spend MILLIONS of dollars defending our wildlife management practices and prove that the black bears in Maine are being treated fairly. Now don’t get me wrong, being a Registered Maine Guide and passionate outdoors person, I certainly have a love and appreciation for wildlife but when I visit the states rural areas and see the level of abject poverty that exists, I wonder how an out-of-state special interest group has managed to push our state priorities this far out of whack. It’s plain to see that HSUS cares for wildlife but how much do they really care for their fellow man? I realize that the folks running HSUS ”ain’t from around heah”, meaning they do not live and work in this state and as such have a real disconnect with the people and politics of Maine. If they were more “localized” maybe they would realize that Mainers are donating millions of their hard earned dollars trying to save Maine’s bear hunt from going the way of the woolly mammoth, money that could have instead been invested in our struggling state economy. Most of the people donating are comprised of Registered Maine Guides, sporting camp owners and non-profit organizations that operate barely above the poverty line and often struggle to put food on the table for their families. The people unable to give the least are once again being asked to give the most. Now of course the state of Maine has been managing the black bear population for almost 50 years, our bear biologists are the best in the nation and with an estimated 30,000 bears in Maine; we have one of the largest and healthiest populations of black bears in the entire United States. 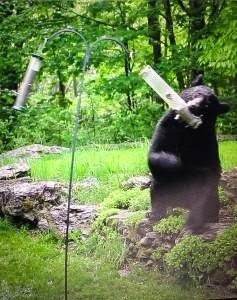 Current management practices of baiting, hounding, trapping all serve as effective means of keeping the bear population under control, so that bears aren’t raiding garbage cans, tearing bird feeders off houses or carrying off our house pets. So given that everything is working great and has been for decades, why is it that HSUS is so adamant about wanting to end bear hunting in Maine? Well, in part, it is tied to the fact that HSUS feels that hunting is an unfair, primitive and cruel practice. Their perceived agenda is to slowly and methodically erode the tradition of hunting until it is no longer seen by society as a viable part of our heritage. It is my personal opinion that they would also probably love to end the consumption of red meat, animals in zoos, owning house pets and fishing if it was in their direct power to do so . . . but I digress. People, myself included, certainly have a disconnect with the meat they eat and when buying a cellophane wrapped supermarket steak we often don’t take a moment to think about the animal that gave up its life, so that we can consume its flesh. Animals die so that we may eat and the way that commercial animals die is sometimes a brutal and unsettling process. I don’t like to see animals suffer and I wish that every animal killed in a slaughterhouse or shot by a hunter passed peacefully into the light . . . but that is an unrealistic and infantile view of the world. Killing things for meat is a messy business and NOBODY respects that more than a hunter, who must kill, butcher and eat the bear, deer or wild turkey they take from the Maine wilds. No matter the rhetoric and finger pointing that comes out of HSUS, hunting over bait is not disrespectful to bear. Many other Maine animals including deer, turkey and even coyotes are also “baited” by hunters using scents, calls, decoys and even bait piles of meat to lure the animals into effective shooting range, so that a humane kill shot can be attained. HSUS states that only “lazy” sportsmen hunt bear over bait and that hunting bear over bait is against the hunters code of ethics know as “fair chase” With that line of thinking, I assume an argument could be raised that compound bows, rifle scopes, range finders and high caliber rifles are also considered “lazy” and against the hunters sacred creed of “fair chase” or the ethical pursuit of game. Maybe to be completely fair, we should all hunt naked and with pointy sticks? I have hunted bear for over 5 years and during that time invested over 30 days in pursuit of black bears over bait. During those many evenings spent sitting in my tree stand staring through the dense woodlands at a small pile of oats and molasses, I was fortunate enough to see 5 black bears. The first bear I saw, I estimated to weigh 125 pounds. Bears are notoriously hard to estimate weight but because I was hunting over bait, I was able to study the bear for almost 15 minutes before ultimately deciding it was a small bear and not in the size class I was looking to harvest. The second, third and fourth bear I saw was a large sow with two cubs. While the sow was well over 200 pounds it was easy for me to identify it was with cubs because of my high perch in a nearby tree and their distraction caused by the pile of bait. Had I been still hunting and needed to make a quick identification and shot, I wonder if I would have been able to determine the sow had cubs before shooting. The last bear I saw was well over 300 pounds. As the monsterous bruin ambled out of the woods, I raised my rifle and upon looking through the scope noted that the available light did not allow me to place the cross hairs precisely on the bear’s vitals, ensuring a humane shot and quick death. I let that bear pass as well as the others, because as hunters we all have a code of ethics that we use to judge and control our actions. This code of ethics operates on an even stricter limit than what is allowed by the law and is driven by our love of the Maine wilderness and the animals that inhabit it. Bait sites are not the tool of lazy hunters they are the tool of law abiding, highly ethical hunters who know that in order to properly identify and harvest adult bears humanely, hunters need time to study and examine the animal they plan to shoot. In Maine’s dense woodlands, this level of study and examination is not just difficult when still hunting bears, it is practically impossible. I wish HSUS would leave us Mainers alone, we aren’t a bunch of dumb rednecks that need to have the management of our state run by outsiders with no understanding of our state priorities. It would be my hope that in another decade I am not AGAIN watching my fellow Mainers spend millions of dollars funding yet another campaign to defend our bear hunting practices, instead I hope that money goes to supporting much more important state matters. Bears are such wonderful creatures. I hope the people of Maine make the right decision and vote to allow respectfully trained citizens to continue to hunt, observe, and ultimately conserve them, so they may be enjoyed for generations to come. I wish HSUS would go away.Far,far away, or change their venue. People soon learn that HSUS and other animal rights organizations work to pass laws but never offer real solutions other pushing their agenda of no more animal use of animals for anything ever. That is their agenda. and can anyone figure up what their agenda has cost the USA economy. We need to think about it. In their agenda is to bankrupt any industry who uses an animal for anything. Just how far will they go? How far will our government let them go. Think about the two people who were saved from ebola recently. Yes monkeys were used in the research and died but this has the potential to help many people and also save monkeys. It appears "humans are at the bottom of the order, below saving animals." Ah, the friendly-neighborhood "environmentalists", convinced that responsible hunting is destructive and that the rural country folk who keep to old traditions are a bunch of no-good rednecks. Seen much of that here in Connecticut, too. They are forgetting that we are a vital part of the animal kingdom, and we have a responsibility to do our best to keep things in order. Our ancestors have hunted animals to get meat for food, fat for wood preservation and primitive candles, organs for consumption, bags, and religious items, and hide for a whole range of things, including clothing and shelter. For all these thousands of years, primitive peoples have managed the environment. Today, people mostly hunt for food and to keep species such as the White-tailed Deer from becoming overpopulous. Why? Well, there are few Natives around to manage the environment, so we have to take responsibility. It is still a symbiotic relationship, something these "environmentalists" will never understand. I am totally with you on this. If they want to be useful, then they should redirect their attention to poachers, not responsible hunters. One wonders how they would react on a trip to Tanzania to visit the Hadza and Maasai hunter-gatherer clans.